Introduce Your Self with Water Lilies. Probably the queen of all aquatic flowers within the world. To your surprise, there are seventy differing kinds of water lilies within the world. They grow only in still, shallow fresh ecosystems like ponds. 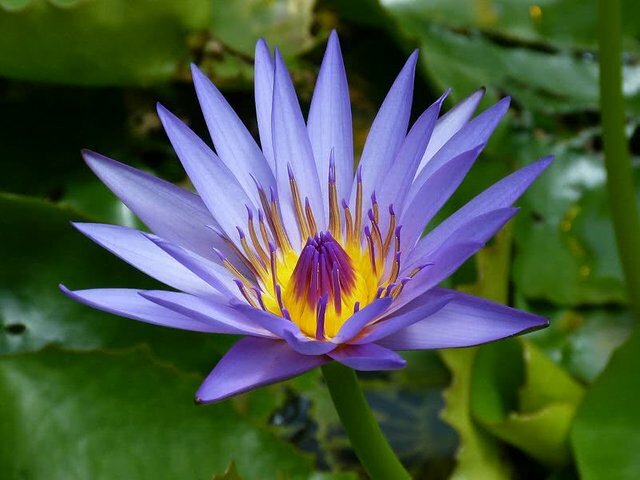 Besides the attention grabbing beauty, water lilies additionally aid in protecting the system the inhabit by leveling the water temperature and providing glorious habitat for fishes. Apart from the eye-pleasing flowers, massive leaves that float above the water surface are another noticeable factor about water lilies. They even have a protracted stem that attached to the bottom of the pond or lake during which the plant inhabit. The pretty flowers open from spring to fall. Like leaves, flowers emerge out of the water surface. every flower opens within the morning and close at the evening. Water lilies are available in totally different colours together with pink, white, yellow, orange, purple and blue. @mamrutiya Wow that's a beautiful flower. I never seen it before. Hey I am new too. Check out my introduceyourself video I posted last night.